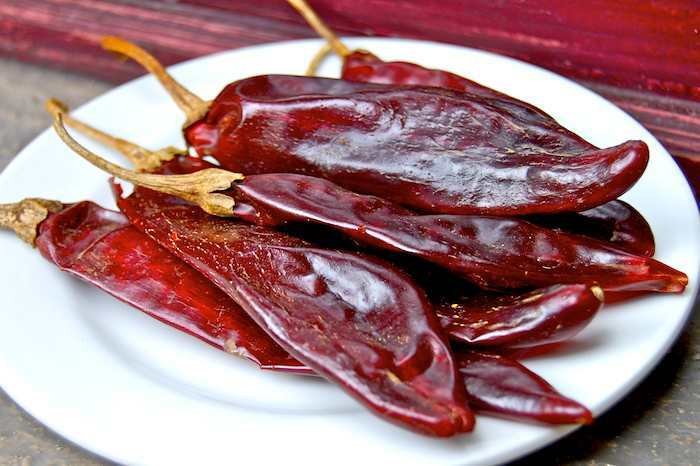 Guajillo chiles [pronounced gwa-HEE-yo] are dried chiles used throughout Mexico as a base for rich salsas and sauces. They add a complex fruity flavor with little burn. Cooks will add other chiles such as the chile de árbol to bring up the heat in a dish. Choose guajillos that have smooth, shiny skin and are still pliable which indicates freshness. Older guajillos look dusty and a bit wrinkled and will crack when bent. They can still be used but their flavor has faded and your salsa won’t be as rich. Your best bet for finding fresh chiles is at a market that caters to Mexican shoppers. The turnover will be much greater ensuring you will always find a fresh supply and fresh counts with chiles. Rinse the chiles under running water to remove any dust and debris then pat dry. Remove the stems. Split the chiles down the side and remove the seeds and veins. For most dishes prepared with guajillos, you generally use them toasted which brings out the richness of the chile and adds a slight hint of smoke and complexity. To toast them, heat a pan to medium hot. Place the chiles the pan and toast them for about 20 to 30 seconds per side until they start to become fragrant. Do not let them burn or they will develop an acrid taste. Once they are toasted, they are ready to be used in any recipe that calls for them. In few dish such as Enchiladas Portales Style in San Miguel de Allende, the guajillo chiles are used without toasting giving the dish a lighter fresher taste. In Mexico, the guajillo chile is called the chile guajillo. In the state of Guanajuato, it is also called the chile cascabel ancho. In the U.S. it is commonly called the guajillo chili and sometimes the guajillo pepper.